The new secretary-general of the International Hydrographic Organisation (IHO), Mathias Jonas, has had a long career, now culminating in the highest rank within the world’s leading organisation for hydrography. He took office this autumn, succeeding Robert Ward, after he was elected in spring this year by the Member States. 'Hydro International' of course wants to know what Dr Jonas envisions for hydrography and the wider world it influences. Mathias Jonas starts off by sharing how he was already in touch with IMO and IHO in the nineties. The last office you held before becoming SG of the IHO was that of Hydrographer of Germany. What do you consider to be your biggest challenge and your main achievement there? The transformation from the analogue world of printed charts to a digital ENC portfolio affected all departments of the office. Starting from the digitisation of surveys and the management of mass data, via their interfacing to the chart production up to the marketing of digital products in all facets of licensing, all the technology, which meant that many of the organisation’s arrangements and many of the skills of the employees had to be rearranged but always in parallel with a continued and stable provision of nautical publications. I am proud to state that our team managed this historic challenge almost completely during my term of nine years. They are not quite finished but there is much more than light at the end of the tunnel – in fact the sun is already shining through the gate. Why did the position of SG of the IHO seem to be a logical next step for you? I have been part of IHO technical standardisation process for decades and long before I ever thought of applying for a position at the Secretariat. During all those years I became more and more attracted to giving my career another spin from a national to an international level. Global cooperation is the basic prerequisite to survey and chart the seas and oceans in a proper way. I felt and still feel challenged to facilitate this collaborative process on an intergovernmental level in a period covering the arrival of new promising technology with the unique chance to fill the gaps in our image of the Earth. How will the IHO membership develop in the coming years considering the number of Member States and participation of the Member States? The new amended IHO Convention, recently adopted in November 2016, eases the former laborious accession process significantly. The Secretariat is now facing a wave of potential new Member States over the next two or three years. Our ambition is to welcome the one hundredth Member State before the centenary anniversary of the organisation in 2021. Though technically made easier now, the accession process itself remains a sensitive one, and I would therefore not like to hint any names at this stage, but if I look at the candidates of which I am already aware, I can clearly identify their vital interest for assistance in capacity building in hydrographic knowledge, skills and equipment. However, their motivation to invest in extended hydrographic activities is not solely driven by safety of navigation issues anymore. As is the case for many other coastal states, those nations are becoming more and more aware about the value of detailed knowledge of all the physics of their coastal waters. Hydrography maintains this knowledge to ramp up processes that are popularly denoted as ‘blue growth’. It is definitely one of our tasks to assist here but likewise to explain that this sort of growth should not exclusively be understood as extended economic exploration. Hydrographic information helps to reconcile the various interests to maintain sustainable use of the blue resources. What technique do you think will have the most impact on nautical charting in the next years? Our native main project in standardisation – the S-100 framework - will offer numerous new options to integrate information on the seas delivered from different domains such as hydrography, oceanography and meteorology. Customised backend solutions will diversify the use of content carried by all the new data layers based on this technology. Our own flagship is S-101, next generation ENC, as successor to S-57 ENC. I am confident that we will see the first version of S-101 published in the second quarter of 2018. Another S-100 derivation, S-104 to facilitate safe navigation by real-time provision of under keel clearance, is well underway and the S-100 concept will finally help to merge text-related content (as still mostly provided in print) with chart data customised to the task at hand. The game changer, however, will be the advent of genuine broadband connectivity at sea. The breakthrough has already been announced for many years but now it seems to be becoming a reality. 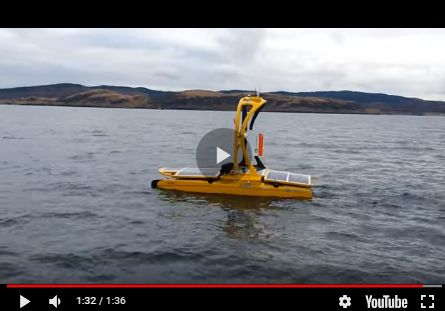 If this happens all the concepts of autonomous operation will gain a push and this in turn will result in new arrangements of navigation beyond the digital nautical charting applications we know today. You aim to further increase the awareness of mariners (and other disciplines) for hydrography. One of your thoughts is to do this through lectures at the IMO´s World Maritime University in Malmö, Sweden. Can you give more examples? It is my observation that mariners are already well aware of the importance of hydrography and our liaisons with IMO and IALA are very helpful here. The problem is to make the step out of this circle. The whole team here at the Secretariat has just started to draft a complete overhaul of our communications strategy including internet, print and mass media. I even believe that we have to adapt our message. We should not limit ourselves to those who measure the depth of the waters. I already intentionally used this phrase earlier: Hydrography delivers information about all the physics of the seas. Our measurements to describe the physical state form the indispensable basis for oceanography which to my personal understanding delivers the scientific interpretation of the overarching processes. To give an example: hydrography measures the timely change of the sediments but oceanography models the currents and tides which make the sands move. Both descriptions of the reality are tightly related to each other. The task at hand is therefore to attract oceanographers to increase the use of hydrographic information by merging with their own data and this can best be done through application of the S-100 framework. An excellent case is ice information transmitted in an S-100 data format (S-411) with direct impact on all offshore activities and the application of tidal and current modelling for real-time under keel clearance provision. The latter matches perfectly with the aspirations of port operators to improve their management of inbound and outgoing traffic. Global technical standardisation is the key for intelligent use of sea-related information and the IHO delivers this. Before anyone starts dredging or building expensive infrastructures he/she should look for smarter use of hydrographic information as, for example, delivered by means of dense gridded bathymetry in S-102 format. This is our message to be conveyed via all channels. What is the biggest added value the IHO can give to national Hydrographic Offices? It depends from their respective state of individual development but if I would be tasked to name one added value for all: we deliver a platform for international collaboration crossing the borders between good and sometimes not so good neighbours to understand their respective intentions, assist them in cooperating technically and enable them to learn mutually from best practice. Do you think that new or updated IHO standards are implemented soon enough by Member States and the industry – and if not, how can this be improved? I observe different speeds: industry is keen to invest in new products and applications and we can never be quick enough to feed them; Member States often struggle with shortage in resources and domestic bureaucracy such as ongoing reorganisations to implement new solutions; the shipping industry itself is conservative in general and focused on environmental aspects these days more than on navigation. Overall, I think our speed is balanced between the various interests, but if it comes to S-100 and S-101 as our flag ship projects we are surely requested to deliver by now. There are several initiatives to drive further mapping of the oceans. Survey of the MH370 flight path has shown that the effort of creating a detailed map of the ocean floor requires many resources. What are your thoughts on the initiatives working on extensive ocean mapping? This campaign reminded us about the enormous dimensions of the seas and oceans and the fragmented image of what we currently hold. To create a detailed image of the deep remains difficult but the available technology enables us to make a quantum leap. Remote sensing, autonomous carriers and smart information processing offer expanding possibilities for survey and treatment of mass data. In the same way as Livingstone attempted to erase the white spaces on maps of inner Africa in the middle of the 19th century, we now look to the oceans to fill the blue spaces with detailed information. But in contrast to Livingstone who went out alone, we strive to federate our efforts internationally and make best use of improved options to create a harmonised image from all data sources. The Nippon Foundation-GEBCO Seabed 2030 project will, without doubt, be the flagship project of this campaign with the ambition to create a complete high-resolution bathymetry image of the seas and oceans by the end of the next decade. To meet this goal it needs coordinated contributions from all parties involved such as sensor and carrier technology, professional surveyors and crowdsourcing. The IHO is helping to synchronise these various activities by administration of the funding. How do you see the cooperation between geo-information private industries and the IHO being intensified? What will be the result? Crowdsourcing is a good example to demonstrate how it can work. The guidelines developed under the IHO umbrella deliver a sound basis for industry to develop technical solutions for harmonised data gathering, and then the IHO advertises in turn for the concept approaching all potential stakeholders such as professional shipping, ambitious amateurs, offshore companies and cable layers. It all ideally results in a much more complete dataset of the global seabed topography. But beyond this, there should be a far more complex dataset of all the conditions of the seas. I once heard from a Dutch colleague the term ‘digital aquarium’ and I like this phrase. Fishing in this aquarium would generate limitless business cases as demonstrated by land bound GISs which have become standard instruments in all aspects of planning, control and supervision. The digital image of the seas and oceans will offer the same wealth of opportunities and a substantial contribution will come from hydrography. Will cloud data and application services facilitate countries in generating more, better or new data – especially the countries that traditionally experience challenges in accessing modern technologies? Cloud technology and applications are middle ware and backend solutions to speak in computer terms. They will not bridge the lack of source data but help to compose a better image from existing datasets. It appears to me that the challenge now lays exactly here. Modern multibeam devices and satellite bathymetry create mountains of data in minutes but it still takes days, weeks and sometimes months to derive the correct topography from the data. Big data management is definitely a topic to be addressed in a better way and customised software solutions are key. We just started to investigate if IHO standards could be of help here as well. Will the profession of hydrographic surveyors move from ships to onshore desks? I was a passionate reader of your article ‘As it was’ written many years ago by Rear Admiral Steve Ritchie, a famous predecessor of my current position. The photographs associated with his texts often showed men at work with special instruments on slippery decks. Beside the historic context these illustrations transported a specific attitude of those who practised: concentration, precision and craftsmanship. The same is true for group photos of the crew – I always noted dedication and pride. On modern images of similar situations the instruments have changed and the crew is gender mixed but the attitude hasn’t changed. It is this habit which will remain indispensable in the same way as seagoing activities for survey and wreck search will never cease completely. Mathias Jonas is Secretary-General of the IHO. He is also Master Mariner, has a PhD in Nautical Engineering, is Reserve Officer German Navy was National Hydrographer and vice president of the German Federal Maritime and Hydrographic Agency, and has represented Germany in IMO and IHO organs since 1998. He was chairman of IHO´s Hydrographic Standards and Services Committee, overseeing a total of nine technical standardisation working groups.